During the spring and early summer of 2013, I still tried to learn some more about Atlantic salmon flies while I could, before my guiding season really kicks off. I was enjoying playing some with materials at hand but at the same time I had to focus on upcoming guide season. So my involvement with the subject was very casual at that time. On one day, at the end of June, I was scheduled to guide DePuy's Spring Creek (www.depuyspringcreek.com) for the world-famous Pale Morning Dun hatch. I showed up early before my clients arrived. I caught up with my outfitter Master Angler – Tom Travis. He was much busier than I was, but before his clients showed up, he was visiting with his friend and introduced him to me as a "world class Salmon Fly Dresser". I greeted him and he was a very nice gentleman. I spoke with him some and just exchanged our cards. And that was it at the point………..
Only several days later, in between my guiding schedule, I was visiting with my neighbor just to catch up with our lives. He's also an avid fly-fisherman who appreciates the artistic senses (building his own bamboo-rods sounds like more complicated than what I'm doing!). I just mentioned to him that I became interested in Atlantic Salmon Flies and I intended to pursue it once my guiding season would be over for the year. He let me borrow a book. He said the book wouldn't be a how-to but just a coffee-table kind of book, yet simply very beautiful. The book features world-class tyers as of its publication. As I went through pages to a chapter to one of Western US tyers, my jaw dropped with awe. The person I talked with at DePuy's Spring Creek only several days ago was featured there!! Twenty two years after the publication of this book and I had been talking with that person. Eventually I have learned this book (Chronicle Books, ISBN: 0-87701-800-6) is regarded as "voices" among those who are deeply involved in the world of Atlantic Salmon Flies. Nowadays, it's the legend. If you want this book you have to look around your local used-book stores or online trades. (That's much easier in this era, as I got mine. You may even find new ones.) The inductee who-is-not-mentioned-at-this-point (as I don't want to trade his name) became my mentor. Also, though indirectly, I came to know the person who dressed the fly on the cover. Everything seemed intertwined through this book. This book can be enjoyed by everyone, regardless of their involvement or interest in fly-fishing and fly-tying. It's solely a beautiful book. For me, it's great to read and helped me to learn "fishing flies" and "display flies". I feel as if I were listening to the personal memoirs of each tier, history of flies, traditions in the region, and so forth. Though this is not a how-to book of dressing, it does contain fly-recipes and bibliography. Also there are superb photos of hooks and feathers. Then all of mastery dressings by our predecessors. I do consider this is a reference book for sure. 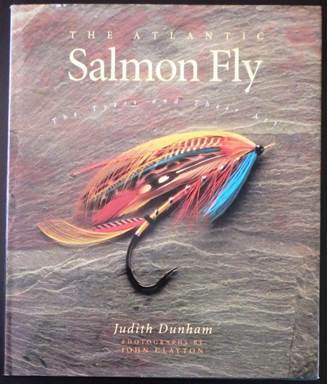 For me, personally and professionally, this book marked a turning point in my career and pursuit of tying Atlantic salmon flies. Satoshi Yamamoto, www.leftyanglerandflies.com, is an outfitter and a fly-dresser living in Livingston, MT.